Dude! I was really enjoying this series and have been anticipating the next chapter. It's been a month. Any news/updates? I know it's probably a busy time of year (it is for me anyway), but I'm justo curious. SacmanXman2 wrote: Dude! I was really enjoying this series and have been anticipating the next chapter. It's been a month. Any news/updates? I know it's probably a busy time of year (it is for me anyway), but I'm justo curious. If I'm not mistaken Tal is studying to take ACT tests. That said, I wouldn't mind a new chapter either. I didn't know that! As soon as he takes the test he should make another chapter then. Until then though good luck! Heyaa, Sacman! Yes, I'm studying for the ACT. I know things are slipping elsewhere, but I can really only focus on one thing at a time. :\ I'll start working on this again soon. The time away from it has cleared my mind a bit, actually, and I have some ideas on how to get past the blocks that were troubling me before. It's very encouraging to hear someone say they like it, though - thank you! I very greatly appreciate that. Talvieno wrote: Heyaa, Sacman! Yes, I'm studying for the ACT. I know things are slipping elsewhere, but I can really only focus on one thing at a time. :\ I'll start working on this again soon. The time away from it has cleared my mind a bit, actually, and I have some ideas on how to get past the blocks that were troubling me before. It's very encouraging to hear someone say they like it, though - thank you! I very greatly appreciate that. That's great to hear! I hope the ACTs go well for you! I just took them a few months ago and they weren't too bad, so don't stress too much. You got dis! I tried the ACT sample papers (even though we don't have to do them in Europe), and I loved the math stuff. Yup, new chapter incoming. I made a promise to someone that I'd write a new one today. Figure I'd better get to work on that. As to the ACT, my main issue is math, actually. I have holes all through my knowledge that I've been working to fill. I'll get there, though. Talvieno wrote: As to the ACT, my main issue is math, actually. I have holes all through my knowledge that I've been working to fill. I'll get there, though. I know you will, Nathan. That's the kind of determination and positive mental attitude I like to read about. I can never stand to give things a half-hearted attempt. I tend to put everything I have into everything I do. Actually, that might be part of why I take it so hard when I fail. Right now I'm re-reading the chapters I already have up to re-immerse myself in the story and make sure I don't miss anything. I'm finding loads of grammatical errors everywhere. I'm cataloging them as I go along, and I'll fix them later. I really want to get that chapter done. I know that feeling. You hope to put your own story on top of your memory to write the next chapter and one hour later you realize that you've been correcting yourself instead of your planned task. looking forward to the new chapter Talvieno! I'm going to edit the chapter tomorrow. It's written up, for the most part, just needs revising/polishing. Talvieno wrote: In the meantime, what do people think of this ship? I like the basic shape, Nathan, but can you explain what the piece which looks like a gull-wing door is all about? 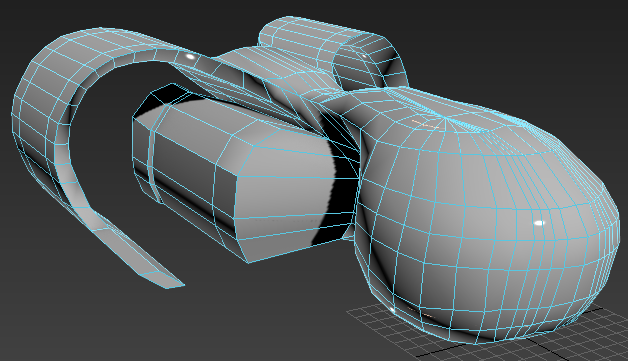 Handy mount for guns, lights, thrusters, what have you, and when I'm done modeling it'll look more flexible - i.e. they can arch downwards more and serve as something akin to landing struts, so that the pilot can enter from a hatch beneath the back of the cockpit. Fair enough, Nathan. I am certainly interested in the progression of your model to its completion. It's a shame we don't have a current LTFC.